I have one word. WOW! What a game this was. From start to finish, both these teams put it all on the line and it went down to the wire. Both these teams are widely considered to be the most evenly matched teams in the competition so from the opening whistle, it was widely evident. At the end of the first quarter, the scores were level; before the Raiders struck first with a rushing TD from RB Christian Gaitau. The Pirates were able to answer back and convert for 2 to take the score up to 8-6 before the Raiders scored in the dying minutes of the half to go into the break, up 13-8. 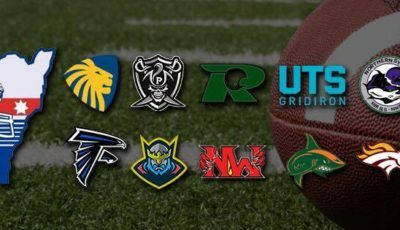 In the second half, it seemed as if the Raiders would pull off the upset of the year and take this one, as they were able to score on multiple occasions and go up 26-14. However, the experience in high profile semi-final matches prevailed in this one as Pirates QB David Ward was able to rally his O and bring the deficit back to within 4 points, with less than 2 minutes to go in the game. The Raiders tried to run out the clock, but an incredible defensive play on 4th and 1 by Pirates CB Pete Goudie was the game changer. 1:40 left on the clock, 4th down and 1 yard to go. Raiders QB Lukas Vojnar opted to pass instead of going to his strong run game. He targeted WR Max Nina on a quick out route. Goudie read this play perfectly and executed a great low hit, contacting the ball with his helmet and knocking it loose, and the play was called an incomplete pass. This set up Ward and his O with 2 timeouts in his back pocket. The Pirates were able to move the ball all the way up to the Raiders 4 yard line, utilising their rushing and passing games. On the next play, Ward looked to the air again for WR Mitch Hunt, only for Raiders CB Matthew Kay to intercept the pass in his own endzone and run it back 100 yards for a TD. The Raiders sideline went nuts… until a yellow flag creeped itself onto the field. The sideline referee and back judge both saw a defensive pass interference penalty on the pick 6 and the play was called back to the Raiders 2 yard line. And in heartbreaking (for the Raiders) fashion, on the next play, Ward found his favourite receiver, WR Kristian Gacuma in the endzone and with that, the Pirates sealed the win. There was a HUGE potential for shock factor in this one. The Rebels were riding a wave of momentum coming into this one and they had everything to gain by knocking off the defending champions. There were glimpses of hope where they thought they could do it but the Lions were… well they were the Lions. Tactical. Relentless. Efficient. Yes there were some mistakes but they came to conquer and they did just that. In the opening drive, the Rebels D set the tone, forcing Lions QB Matt Hilley to make a decision on 4th down. The Lions decided to go for it and were stuffed by the Rebels D and this worked in favour for the Rebels as they were able to move the ball down the field and score on their opening drive. The Lions answered back with a TD of their own to end the first quarter before turning up the heat in the second and adding an additional 20 unanswered points to go into the break, up 26-8. In the second half, the Rebels D locked down the field and forced the Lions to work very hard to score points. Rebels LB Daniel Pearson was all over the field, picking up a number of key tackles for losses, as well as an interception. And on the other side of the ball, the Rebels O worked meticulously through FB Stephen Armstrong (who ran the ball for a number of key first downs) as well as WR Eric Chang (picked up key receptions, including a deep pass for a TD), and RB Mitchell Kirk (racking up the yards on the ground and scoring a big cutback TD). With all the power in their O, they could not match the power of the Lions, who kept coming back and adding to their lead. The Rebels outscored the defending champs in the second half, but they couldn’t match the strength of the Lions. Lions RB Charles Adams has fit into the Lions O perfectly following the loss of RB Alex Watson (to injury) and racked up the yards on the ground to secure the W for his team. And on a final note, I’d like to extend a big thanks from everyone at GDU and the Gridiron NSW Community to a Rebels player who is retiring from the game after 20 years. 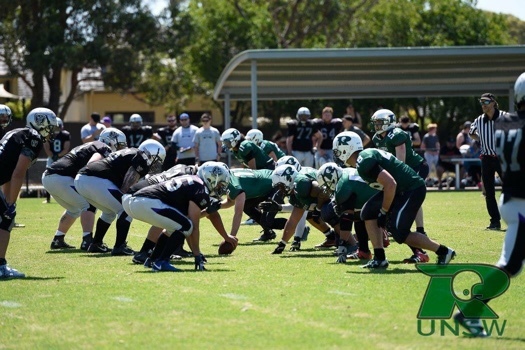 OG Matt Steel has represented Australia as well as playing for UTS Gators and the Rebels over the years and he has also worked tirelessly behind the scenes for Gridiron NSW and Gridiron Australia to further the game in this country. 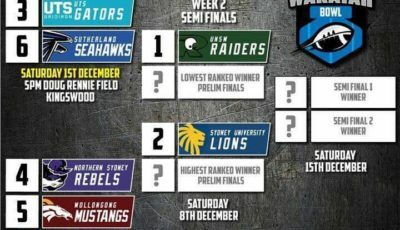 In the dying minutes of the Sydney Uni game, big no. 74 declared himself eligible and came onto the field for a 2 point conversion, running it in and sealing the 8 points for his Rebels. Many thanks for your years of service Matt and look forward to seeing you on the Rebels coaching staff in the coming seasons! 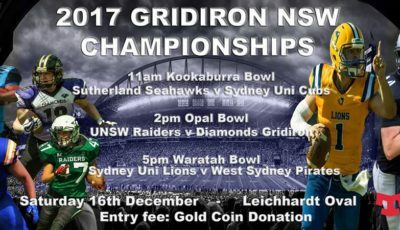 With the win, the Lions have booked their place in another Waratah Bowl, their 14th in a row, with a showdown with the Pirates impending. Stay tuned for my Waratah Bowl Preview later this week where we’ll look at key players who could be game changers for both sides.